So it’s come to my attention lately that maybe I haven’t been providing as much value to you all as possible. It’s easy to get caught up in the “I’m not good enough” or “I don’t have enough experience” thought process, but the truth is, I do make a little money from painting furniture and I’ve been exploring this hobby for over a year now, so surely I have something to share. I frequently get questions from my friends and family who are interested in painting their own projects, so I think it’s time I begin explaining my process from start to finish, and discuss all the decisions I make from buying paint to sealing everything in and getting it ready to sell (or use). I do want to include a little disclaimer here that everything I know, I’ve learned through my own experience. Some of it may not be how you’re “supposed” to do it, but rather this will an account of what has worked for me so far. I have no shame in admitting that I don’t know everything there is to know about painting furniture, and I’m probably doing some things the hard way, or the long way, or the wrong way. But hopefully, those of you who are interested in painting your own furniture will learn enough to branch out and make your own decisions about which products and techniques to use. 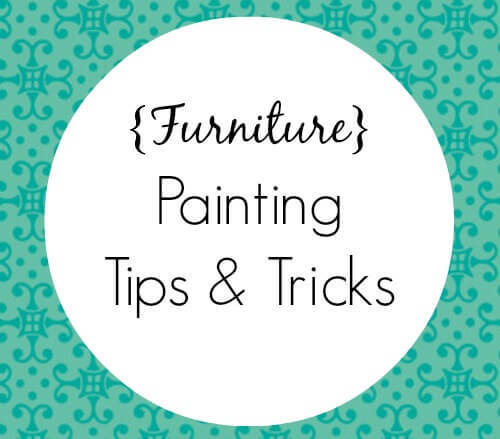 What questions do you have about painting furniture? I could use some tips for painting lower end furniture–think laminates. A lot of the time I see cute, inexpensive Ikea stuff but don’t care for the color.Do you have any thoughts on that? Hmm…well my typical advice would be to stay away from that type of furniture for painting purposes, but if you’re set on using it, I’d recommend using spray paint so it’s not streaky since there’s really nothing for the paint to sink into. And make sure to use a primer and a sealant (spray), but I still can’t guarantee that it would last very long. I would think that it would scratch off really easily, but you can always try it on something cheap first!